With an impressive reputation for being amongst the finest airports in the whole of North America, Calgary International Airport (YYC) has much to feel proud about and currently ranks as Canada's fourth busiest. In just a year, over 12 million people will use Calgary Airport's 30+ airlines on around 250,000 flights, to reach over 70 destinations. The majority of these cities are based in either Canada and the US, although both London and Paris are also popular locations. Calgary Airport is to be found approximately 20 km / 12.5 miles northeast of the city centre and next to Beddington Heights, Coral Springs, Country Hills, MacEwan and Temple. Both West Nose Creek Park and the McCall Lake Golf Course are also nearby to the airport and important local landmarks. Air Canada has a significant presence in three of the terminal's four concourse areas, along with Air North Charter, Canadian North, Central Mountain Air and Calgary's very own budget carrier of WestJet Airlines. Calgary Airport is served by shuttle buses (at Bus Bays number 10 and 11), buses (including Airport Shuttle, Banff Airporter, Brewster and SkyLink), limousines, taxis and 'Airport Sedan' cars. Some services connect to Banff and other neighboring towns. 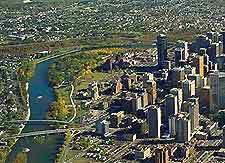 The city of Calgary is nestled in the foothills of the Canadian Rocky Mountains and within the province of Alberta. Calgary is a popular tourist destination and famous for its array of winter sports and in 1998, the city's actually hosted to Olympic Winter Games. Many tourists fly into Calgary Airport (YYC) each year for its seasonal cross-country skiing and snowboarding alone, while others prefer the warmer summer months, when outdoor recreational activities are plentiful. Some of the main highlights include the observation deck at the Calgary Tower, the Canada Olympic Park, tastings at the Big Rock Brewery, and the eye-catching Calgary Chinese Cultural Center. Located on the eastern side of the downtown district and on George's Island you will discover Calgary Zoo, the Botanical Gardens and also the many dinosaur statues within Prehistoric Park.